This is the first book I’ve read by James Lecesne. Now that I know his first one, Absolute Brightness, was a Morris Award nominee, I’ll be hoping to read that, as well. 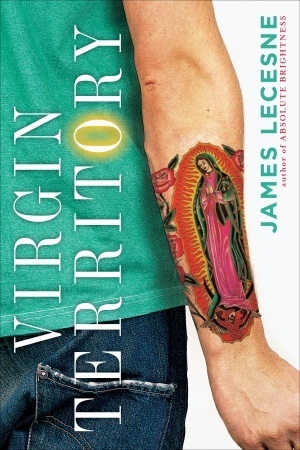 Virgin Territory is rich with metaphors and layered with imagery I enjoyed. That probably makes it seems purply-prosey, but make no mistake, the voice of the book is strongly male, and swift in it’s descriptions. I love young adult books that brush up against religion, which this one did, making it seem like setting, but actually being more. If you are a believer in reality and science, don’t let that scare you off from reading this. The “religion” aspects are more about finding faith in yourself, your memories, learning to engage with your community, and making truth out of what may or may not be fiction. I would have liked to have seen a little more development with the minor teen characters. I didn’t love the teen girl characters, but I’m not sure I was meant to. The adults in the book were well-formed, especially Marie, who is the main character’s gram. I remember disliking reading about old people when I was a teenager. I love it, now. Specifically, I love seeing how teens interact with the elderly. When it’s done well, as in this book, there’s sweet, sad satisfaction about the circle of life that washes over me. My favorite idea from the book is that most of life is a big mess with a few clean and clear spots among them. You may find yourself in a moment of clarity or satisfaction but it always go back to messy. It wasn’t as simplistic and pessimistic as I have probably made it sound. So, I recommend reading this one, which is more enjoyable than my review. Really dig this book cover, too. Egmont USA has a good thing going, not only with their covers, but I’ve really enjoyed a few of their books in the short time they’ve been producing them. Thanks, Brian! Blessings to your family, as well!